REMINDED of the coveted reward every player dreams of, San Miguel Beer used it as motivation. Hours after receiving their championship rings for ruling the last all-Filipino conference, the defending champion Beermen shut down Meralco, 101-85, to gain a piece of the early lead in the Smart Bro-PBA Philippine Cup at the Smart-Araneta Coliseum. The Beermen drew solid contribution from all around as five players, led by Alex Cabagnot, scored in double digits to pull away late and frustrate a rejigged Bolts side that drew an impressive pro debut from Chris Newsome and saw the first game of Jimmy Alapag back from retirement. SMB thus notched a second straight win, following up a 97-86 win over GlobalPort in Davao last Saturday. 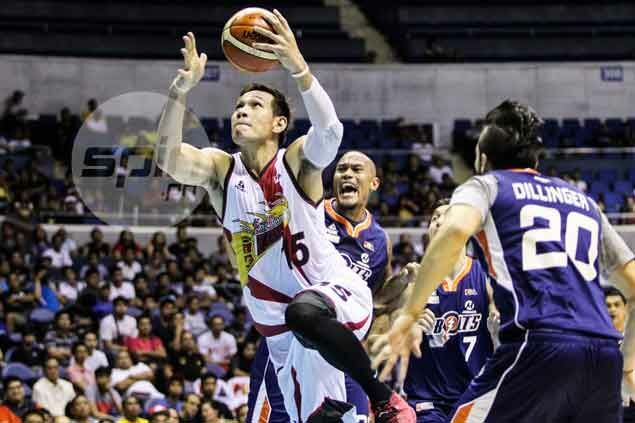 Cabagnot tallied 18 points, all but two in the fourth quarter where the Beermen turned a nip-and-tuck battle into a rout despite June Mar Fajardo putting up a relatively quiet performance with 14 points and 12 boards. Newsome finished with a team-high-tying 14 points, including two on a highlight slam dunk over Arwind Santos early in the third quarter, where the Bolts stayed toe to toe with the Beermen until the defending champions started their game- breaking run. Trailing, 60-55, with a little over seven minutes left, the Beermen banked on a 17-7 run to grab the lead heading into the fourth quarter, where they slowly pulled away.